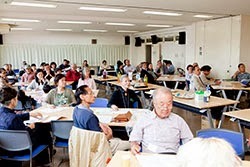 Sunday, May 26, the IAK Annual General Meeting was held at Karuizawa Chuo-Kominkan. Sevety members including their families were present to discuss the meeting agenda and enjoy the tea party afterwards. As of March 31, 2013, IAK has registered 149 regular members (86 individual, 60 family and 3 corporate) and 8 supporting members (2 individual and 6 corporate). The actual number of members is 240 since its foundation on May 27, 2012. 1. Fiscal Year 2012 Activity Report : as per described in IAK Newsletter # 2. Communication, printing, events arrangements, etc. With change of the auditor, Mr.S.Yokoyama, its successor made the audit report to the above. Some members proposed to raise annual dues to be used towards other IAK activities. However, as we are only in our second year, IAK should give priority to the publicity of activities to obtain more members and let each event go on self-sufficient basis by charging admission. AGM agreed in maintaining the membership rates. As an inauguration event of Karuizawa Ice Park the international matches were held between April 17 to 21 among the teams from Switzerland, China, New Zealand, Korea and Japan. IAK cooperated with the event to provide interpreters in English, French, Chinese and Korean languages. ★ IAK holds the open event, “Bhutan Day”. On Sunday, June 23 IAK presented residents in Karuizawa, members and non-members, the program of introducing the country “ Bhutan” at Chuo-kominkan. Mr. Tshering Norbu, a Bhutanese living in Karuizawa shared his culture and customs by using photos, video and PowerPoint. 50 attendees enjoyed his presentation having home-made cookies of Bhutan, tried on Bhutanese clothes and expressed desire to visit Bhutan. ★ Hiking fans get together. Lovers of hiking enjoyed outings to Ikenodaira on June 9, Hanareyama on Jun 22, Asamayama on July 15 and Takaiwayama on August 9. Bad weather cancelled plans twice to Karamatsudake. On June 30, forty IAK members gathered for a barbecue party at Hoshinko Pension. The cost was 1,500 yen each for great food and drinks. Hirakawa-san and Okura-san gave Japanese lessons of daily expressions to six foreign adult attendees on Sep 14. The first lesson was the basic phrases for telephone conversation and hotel reception, and the second one was for shopping such as how to count the number of tuna fish and conversations at the cashier. After class, everyone went shopping at Tsuruya supermarket for practical use. As of August 31, sixty members responded to the IAK town survey. These responses have been well-documented and are being analyzed for comments by IAK Support Division. 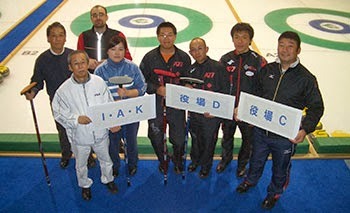 ★ IAK team entries the curling match sponsored by Karuizawa S.C. The games started on September 10 with the final match on October 27. Keep your fingers crossed! This year IAK has issued member ID cards for use at IAK-sponsored events and to be used as a name tag. If you haven’t renewed this year, please pay according to the following chart. Being located on a north-facing slope, our garden is damp and cooler than those in town, although it does get the sun. Four years ago, I planted a young peach tree. It started to bear fruit two years ago, and a lot of small peaches were on the tree last year. This year, it produced about one-third the quantity, but each individual fruit is larger. This poor tree is doing very well considering it gets very little nutrition. I was truly surprised to see so many fruits on the tree. I felt sorry for it and now feel that I must take better care of it. 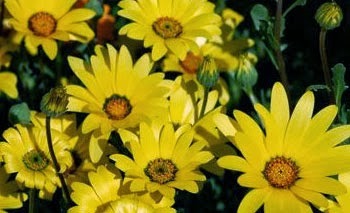 I tried a variety of plants in the garden, many disappeared, but some survived. The conclusion I reached is that the local plants, especially those that grow in damp places survive better. The local plants are the best ones. It is natural but one tends to grow flowers that do well in other countries, because we remember them flourishing in the places we once lived. What remains the same in Japan and England is that our garden is always in a very natural state, and I can find wild flowers in the garden. It sounds lovely - maybe, but the truth is that I do not have enough time and patience to take care of the garden, and as a consequence, it goes wild! Oh well, that’s life. First, their living circumstances favour them. 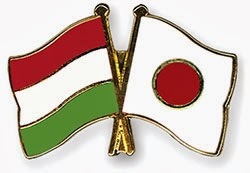 Hungary is a tourism-oriented country to receive a few times bigger number of tourists from abroad, than its population (9.9 million), similar to the situation of Karuizawa. And in towns near the border the languages of neighbouring countries are very familiar in people’s daily life. Second, under such circumstances, they learn foreign languages through ears as well as native language. Hearing ability by ears seems to be matured by the ages 4 to 5 years old to distinguish the difference of various pronunciation by language. Mr. S, a friend of mine says he became able to speak German easily when he played with German kids in his neighbourhood. In Hungary I often saw working people at car-parking places, cafeterias or train stations speaking fluently 3-4 languages learned by ears. In the case of Japanese language, although local dialects contains various type of vowels, any pronunciation is limited to express in only 50 letters. This applies when we learn foreign languages at school, which might prevent us from improving hearing ability. Third, we often encounter the scenes that Hungarians boldly approach foreigners and please them by imitating foreign words as taught by them. They try to brush up their conversation skills. This reminds me of IAK’s speak-easy salon which values to promote speaking ability as well as friendship. My comment as a non-linguist is to emphasize Karuizawa is in a position to accommodate the above three conditions. When IAK, local administration and residents mutually support to promote international exchange and become successful in establishing the community adopting foreign languages in daily life, I am sure to step forward and advance my speaking ability.